Whilst the next AVBCW Big Game JP & I are planning is nearly 8 weeks away, experience has taught me to start now. 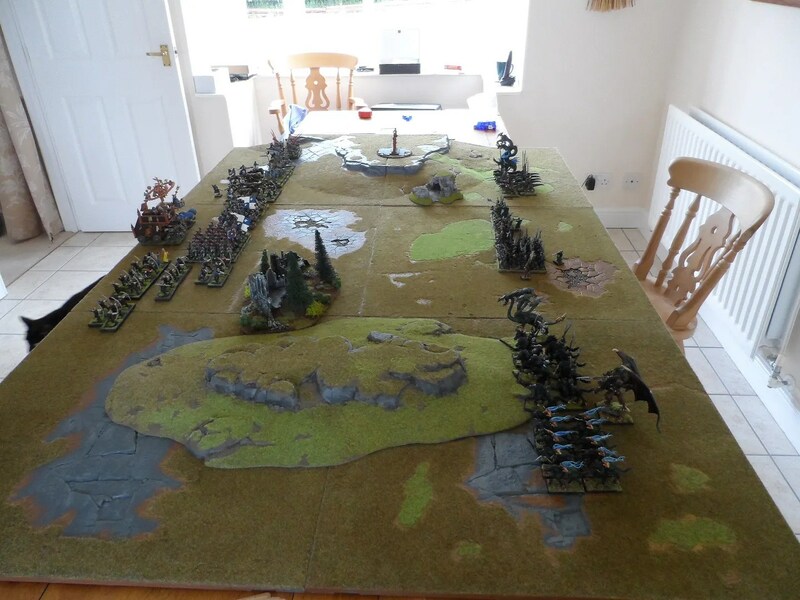 As we have some 14 people attending, and three 6×8′ tables to dress we need to start planning and actually creating scenery. One of those plans, is for some defensive positions. So I bought a couple of sp[rues of the new Renedra Sand bags. 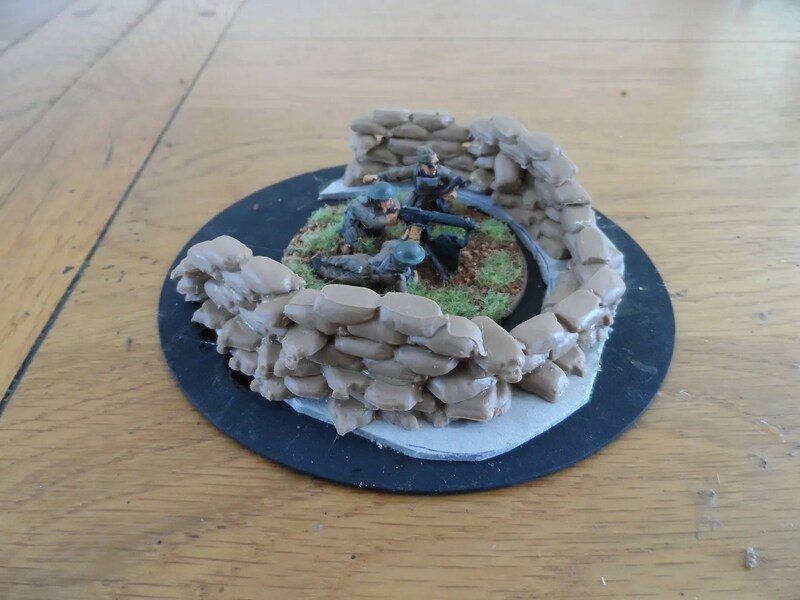 Then I started making a sandbag emplacement for a support weapon. 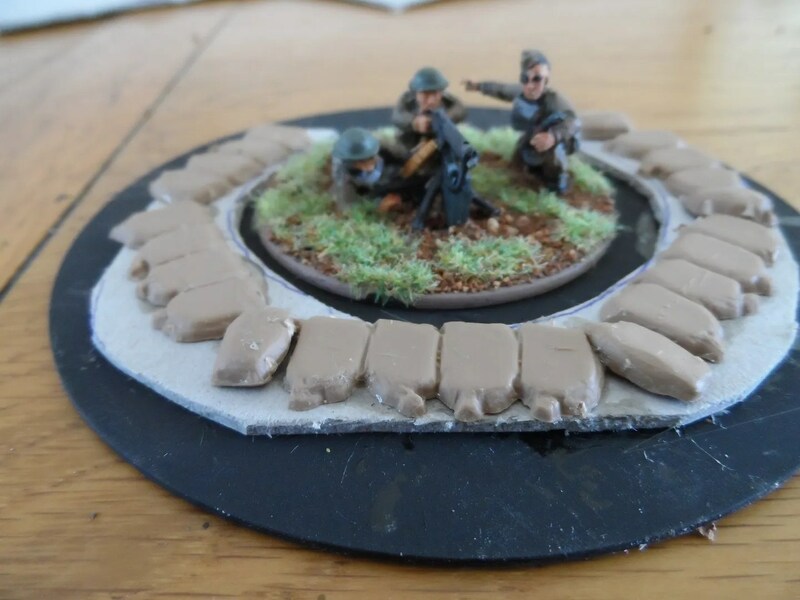 Yes using a CD scenery base gave me plenty of room, BUT, the sandbags are pretty thin, so I soon realised that I’d waste an entire row of sand bags just to get above the base level of the support weapons’ base…in other words wasting a lot of money ! A card board uplift ! 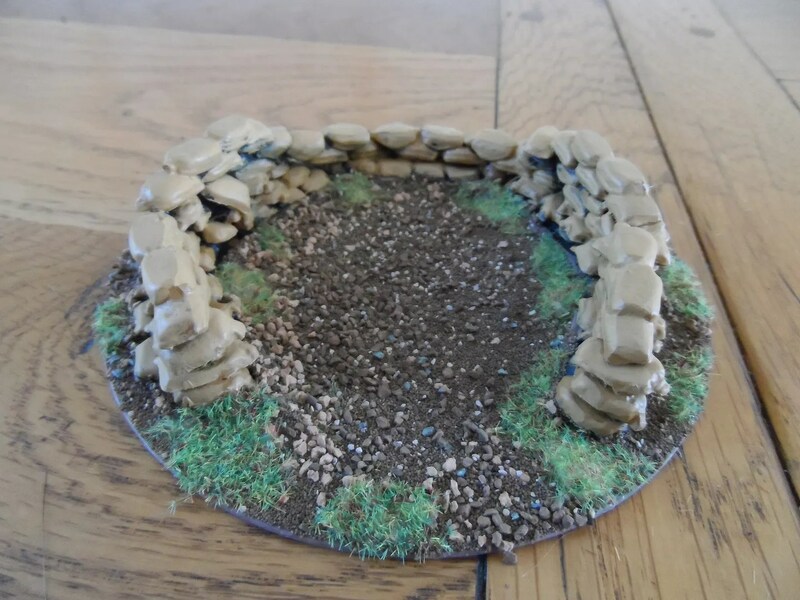 The base sandbags are also a different shape and there are a limited number of them on the sprue. Then there are the sandbags that make up the rest of the bunker wall. These can all be altered easily enough. Then I built the bunker up with the rest of the sandbags. 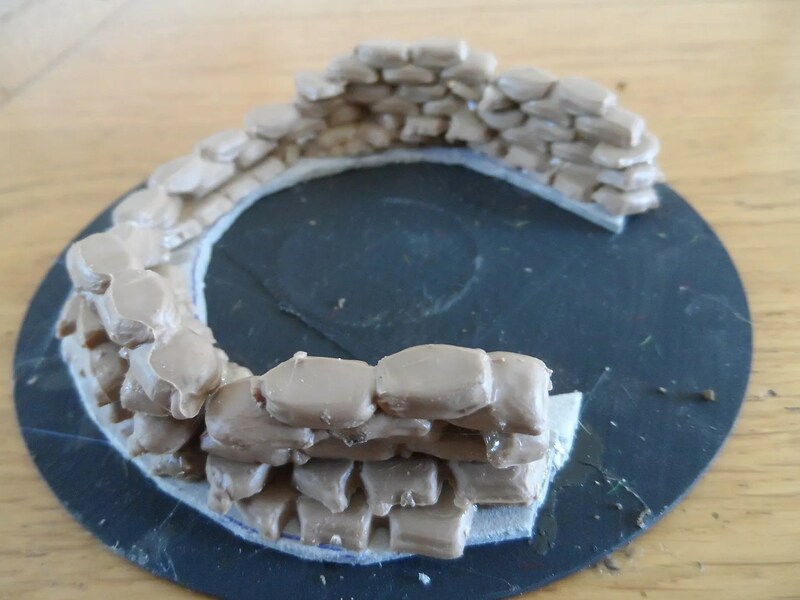 There was a noticeable casting line on one of the sprues I had, but this can be written off as a seam especially when we are building wargames standard scenery. I made sure that the front of the bunker pretty made sure of a 45 degree fire arc. 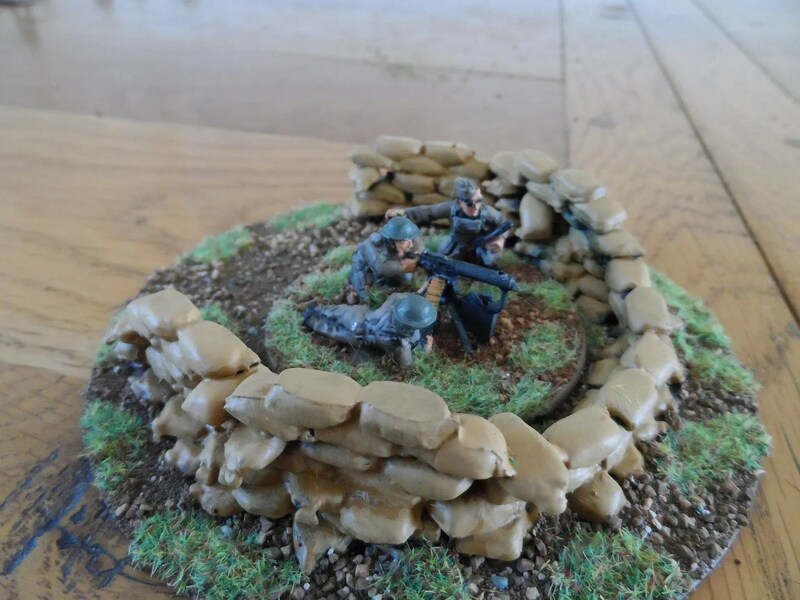 The bunker painted and flocked. yes I have been busy mixing up new flock as well, as I have got through a full pot of flock and a full pot of glue so far this year already. Byakhee Jim has been away for a while, but returned yesterday at a rather short notice WHFB game. 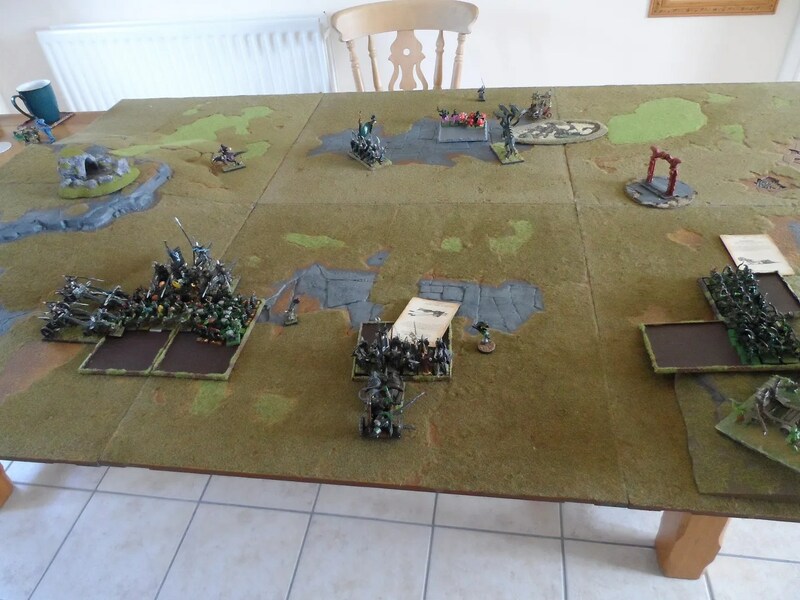 So we had a 2k point game of Warhammer, he was playing Orcs & Goblins, and I as ever was playing Dark Elves. 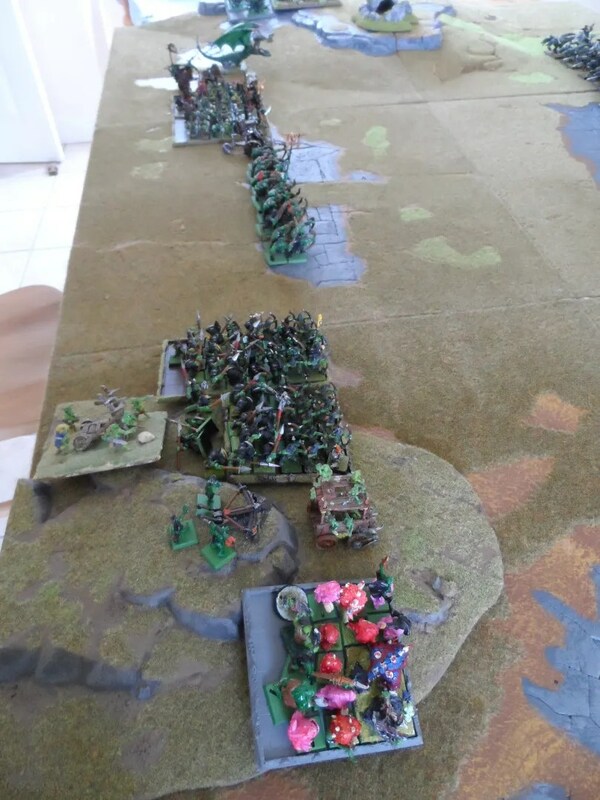 Stone thrower, bolt thrower, herd of squigs, two huge Goblin archer units, some Orcs,a boar chariot, goblin wolf riders and 2 snotling pump wagons. 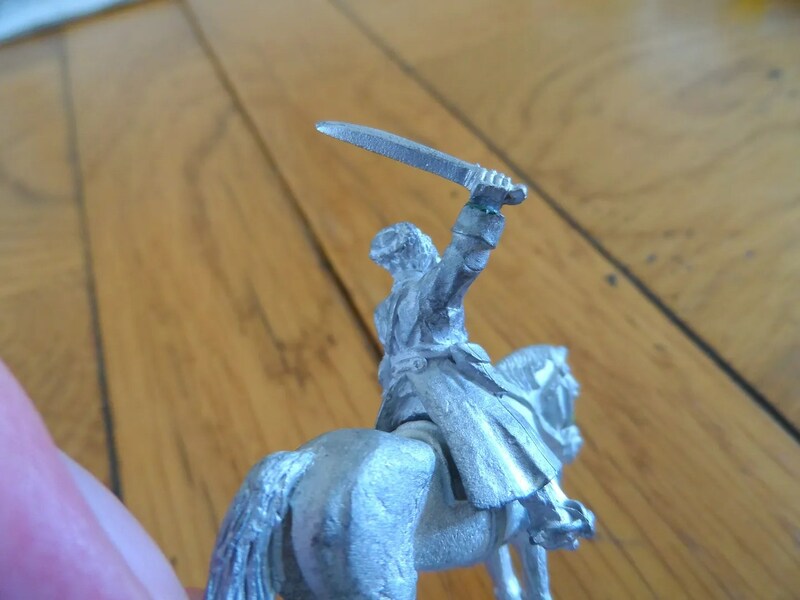 OH and his general on a Wyvern. Warlocks, RXBs x2, Silver Talons, Spitty the Hydra, CoK, and two CoK Chariots. 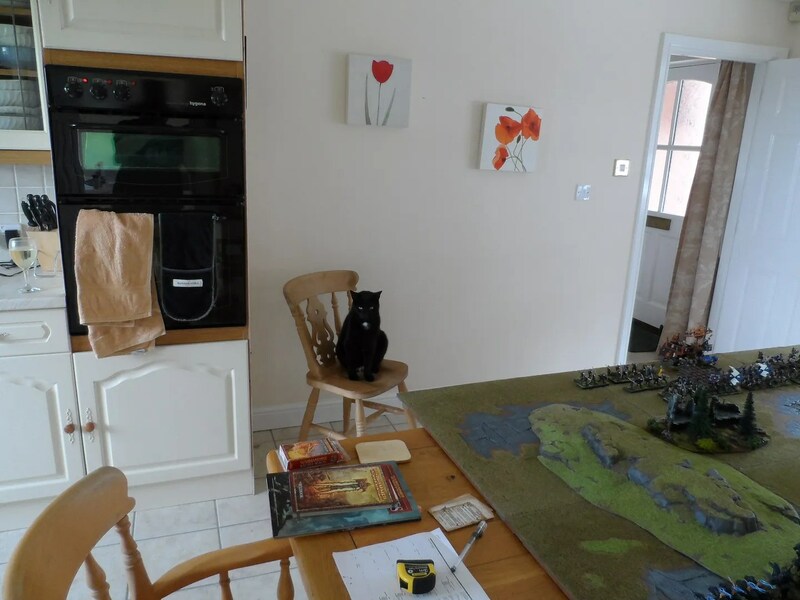 I wasx baffled by his deployment, and he all but admitted it was a bit of a mess. 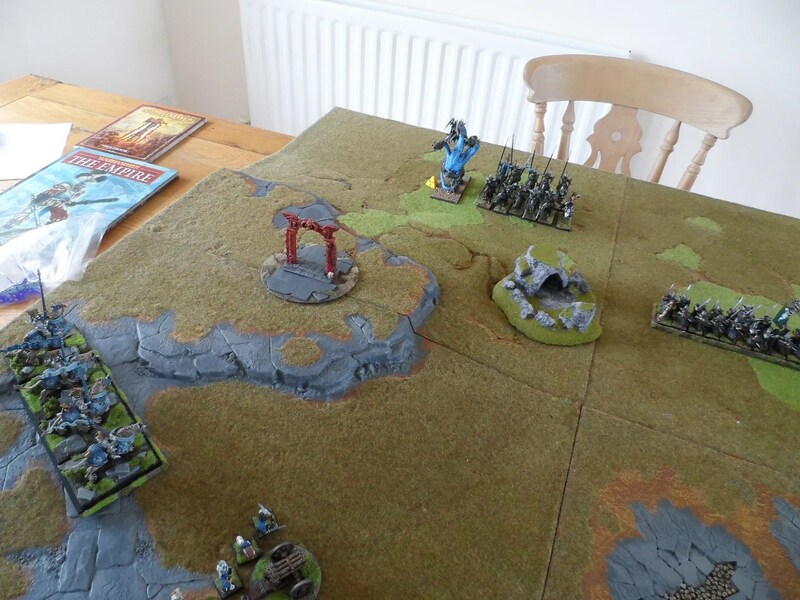 He won initiative, and promptly hid his General behind a snotling pump wagon that also was, not quite running away from its initial deployment. We had a chat and agreed, that the deployment of heroes, specifically Orc generals on Wyverns was one of those interminable mysteries. The models look really good, but in game terms are mostly a liability. 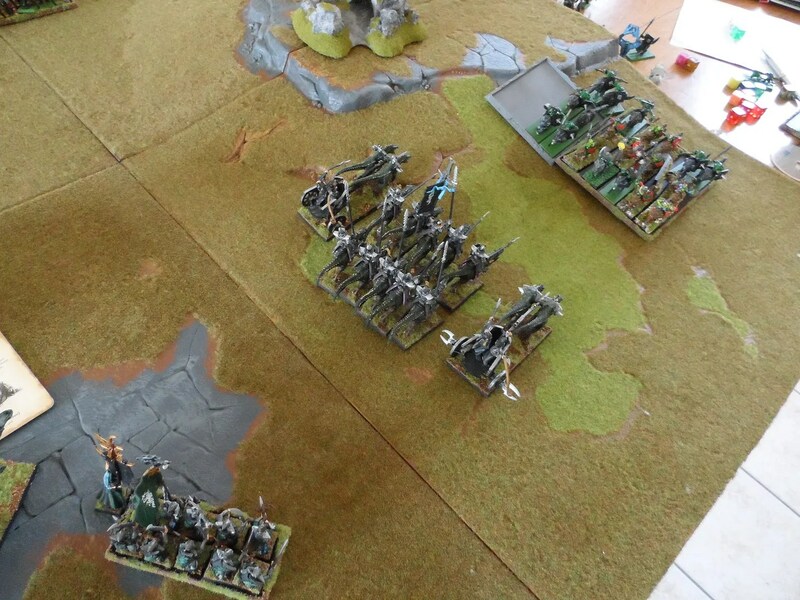 The wolf riders, using the vanguard move, outflanked me, causing me to have to redeploy huge amounts of my army. So Jim was quite pleased. This later turned out to be a hollow victory, as it spread his forces way too thin. Unlike last game, I shifted all my units into an aggresive attack mode, pimping them up with augment spells. For various reasons, Jim’s goblin shamans either failed to cast spells, blew themselves up, or were otherwise ineffectual in the magic phase. 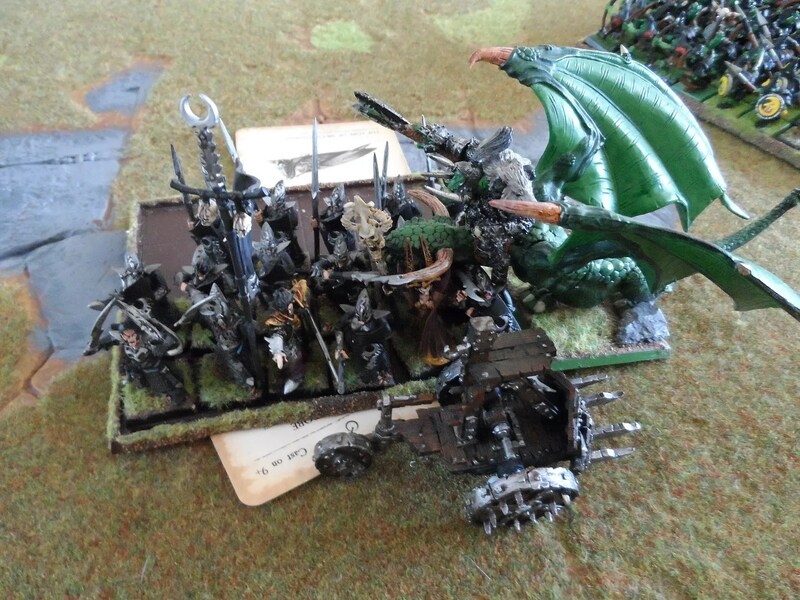 That said, my Warlocks had rto race around and reposition themselves, using the Portal of Kittens as cover (long story). 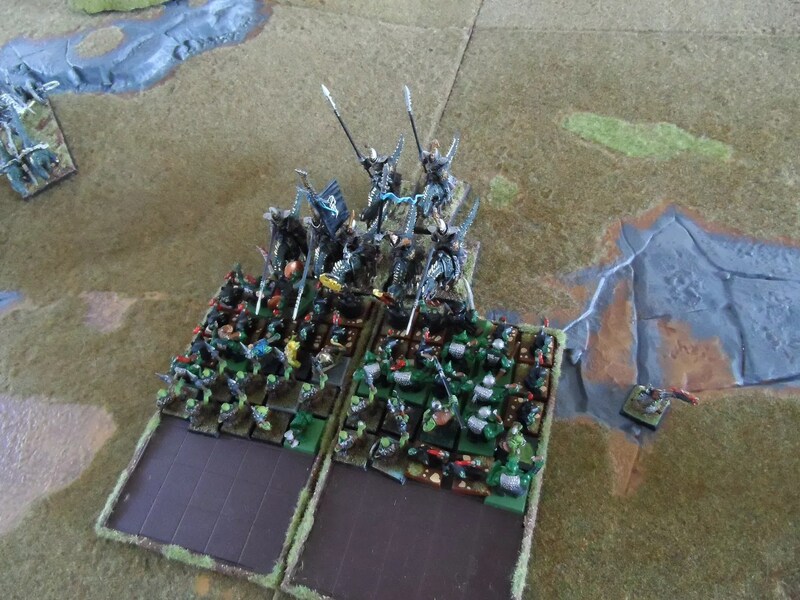 Goblin models treated with contempt – as I commented, Byakhee Richard would have a fit with models being poured on to the table like this. 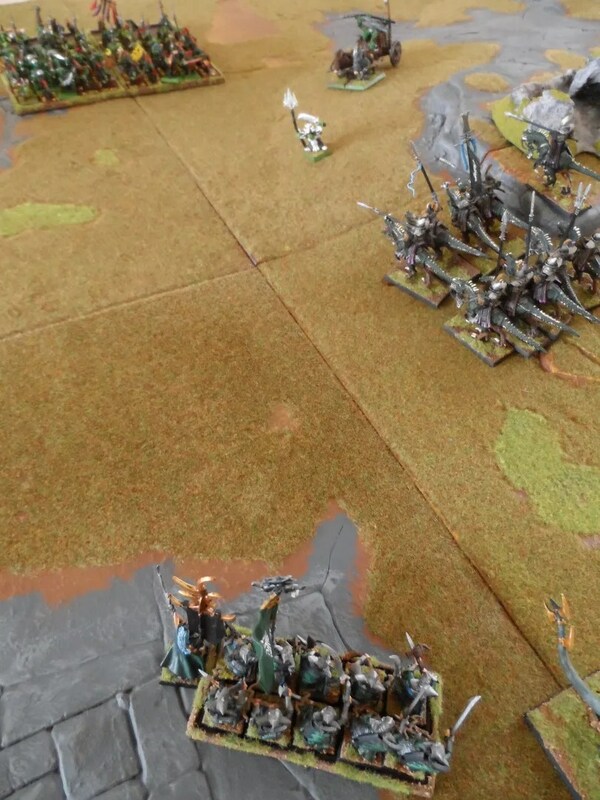 With a banner of swiftness, the Silver Talons charged the Orc Archers in turn two, even a goblin fanatic released from a neighbouring Goblin unit failed to stop them, and crunch time happened. 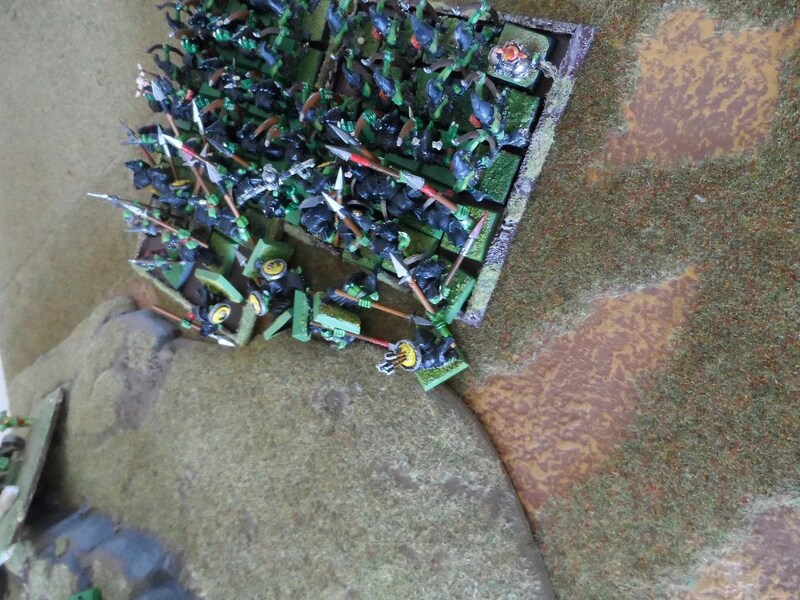 Faced with a wall of Cold One Knights, the Goblin wolf riders dodged round them and behind the rest of my army. 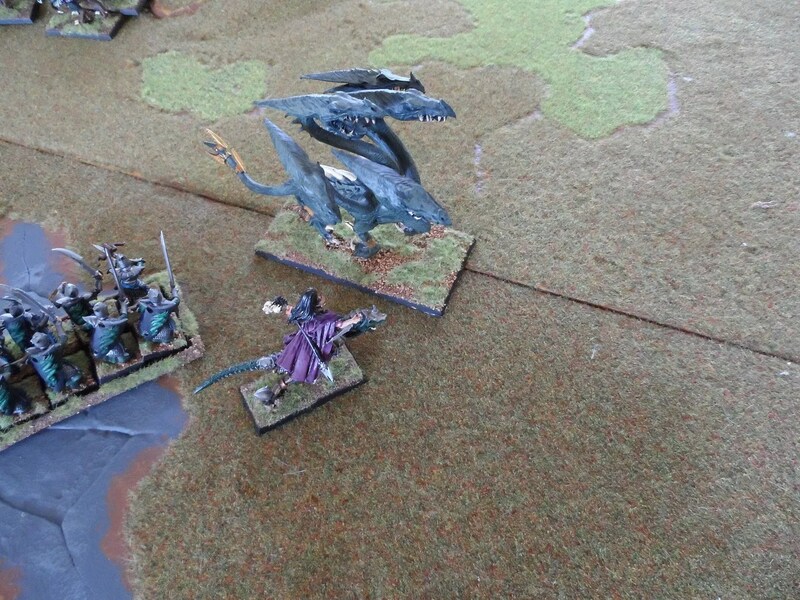 Unfortunately, they then encountered my Sorceress, who unleashed Blade Wind on them in the magic phase. they then failed their leadership test and fled the battlefield. Adios 21 wolf riders ! Leaving Spitty with a lump in her throat. This eliminated the threat of envelopment, and allowed my CoK to let loose. A goblin shaman bravely (?) 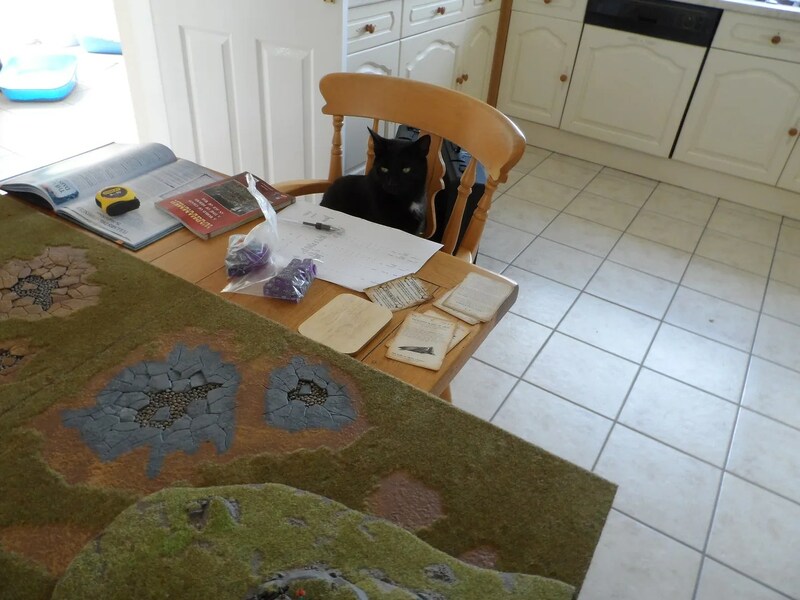 unleashed a great spell using about 5 power dice, and promptly made a mess of things. The spell didn’t go off. By now, I had rolled NO dispel dice by turn three. As you can see the Shaman, didn’t last long, he wasn’t even a speed bump by the time the RXBs had riddled him with bolts. 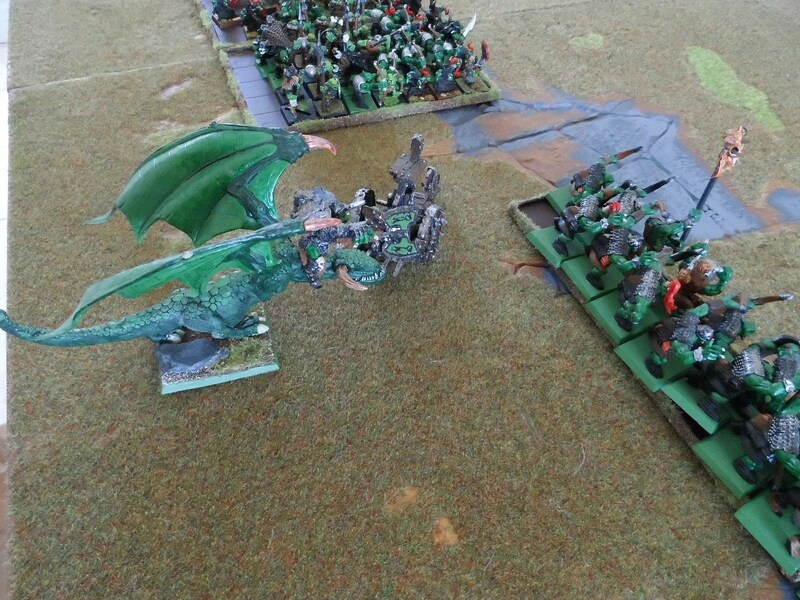 The Silver Talons steamed through the Orc Archers, and followed up onto a pump wagon, only to get side charged by the Orc General on Wyvern. A challenge later, a wounded orc General defeated Samartik my Hero. But, my unit held. 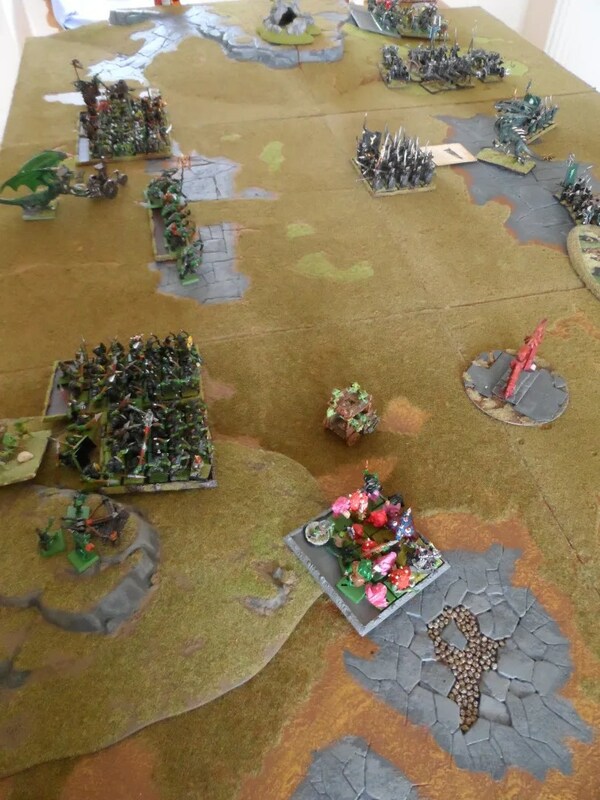 In the same turn, my Sorceress, zapped the second Goblin archers unit, again with Blade Wind, and wiped out 31 of them. ! Naturally a failed panic test later and they were running away. It wasn’t going all my way. The Portal of Kittens, spewed force magicks, and injured both my unit of Warlocks and the Squig hoppers, but not enough to stop them meeting in combat, and they defeated my Warlocks – at a price. 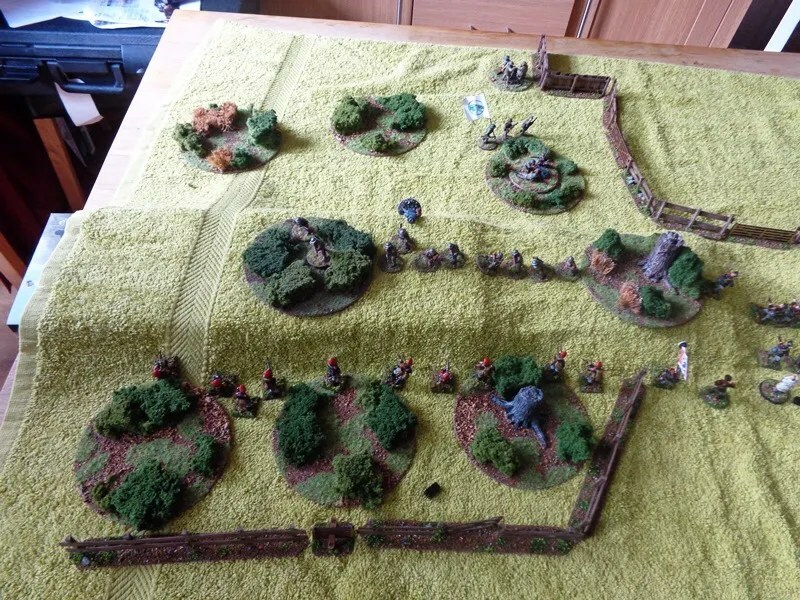 The Silver Talons defeated the Pump Wagon and Orc General in the second round of combat, causing the the General to flee way beyond the artillery on the hill. They restrained pursuit, until an Orc Boar Chariot decided a sideswipe from the two CoK Chariots was not advisable and hoved into view. 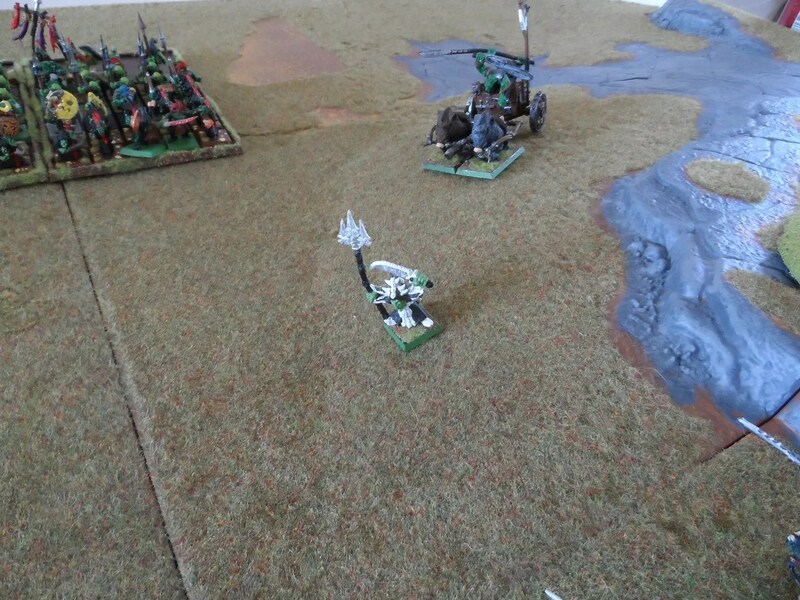 The CoK, had meanwhile, redirected their charge from the boar chariot, onto the goblin host, losing a knight on the way in, they duy proceeded to trash the goblins for another couple of casualties. 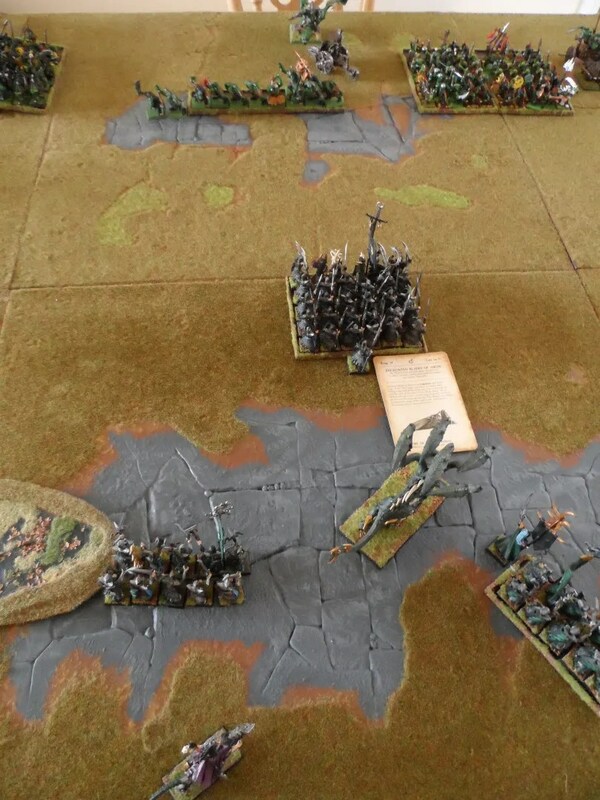 The goblins being steadfast, stood there and took it. Unfortunately, allowing themselves to be side charged by the CoK Chariots. 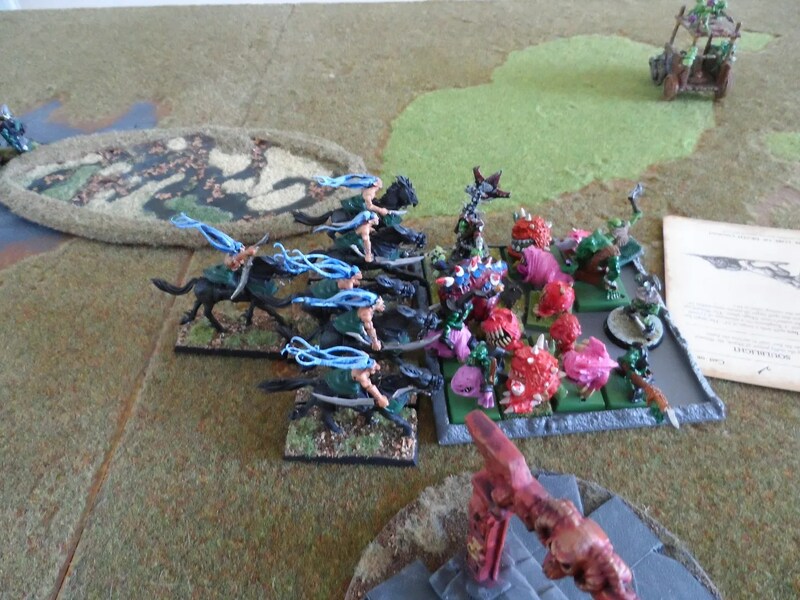 In the meantime, the squig hoppers charged a unit of RXBs, and all but wiped them out, causing me a bit of concern, but with with Spitty and the Sorceress to hand I was confident of dealing with them. 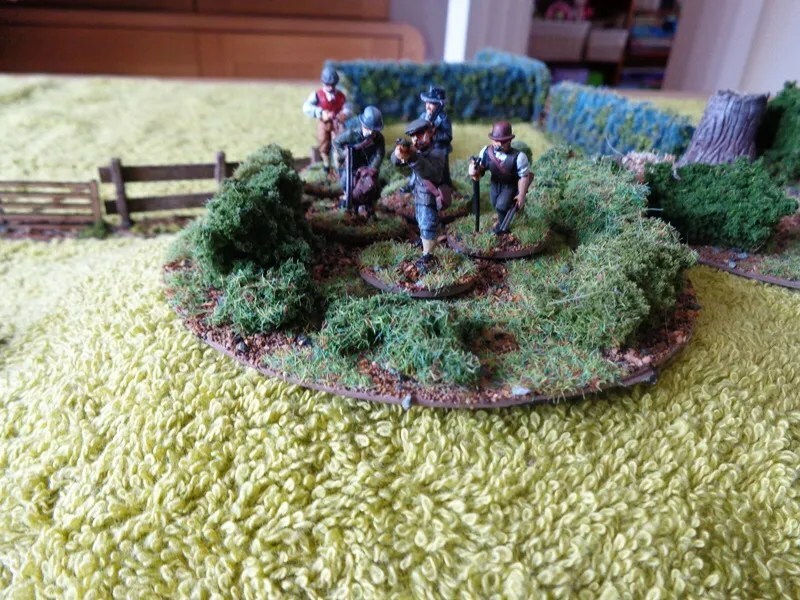 The second and last remaining pump wagon took a leisurely tour of the field and harmed no -one. 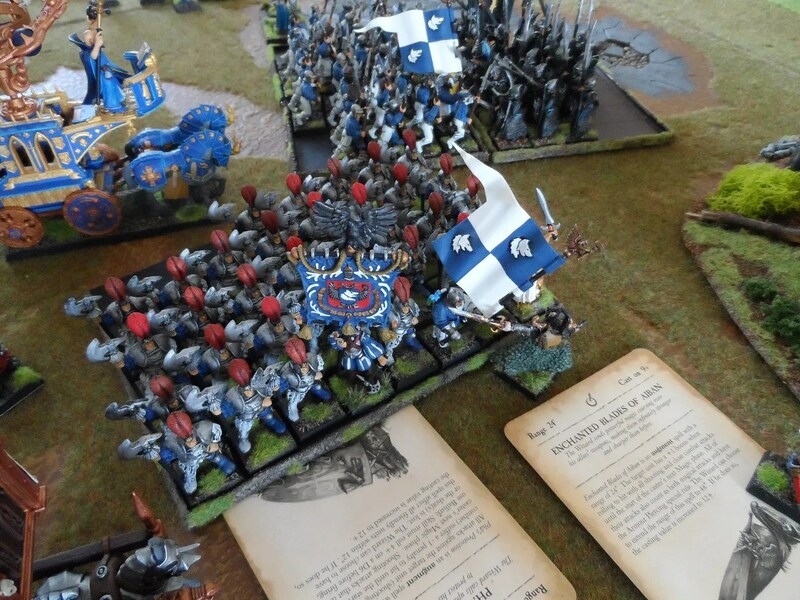 I still made mistakes, but an aggressive stance certainly suits a Dark Elf army. 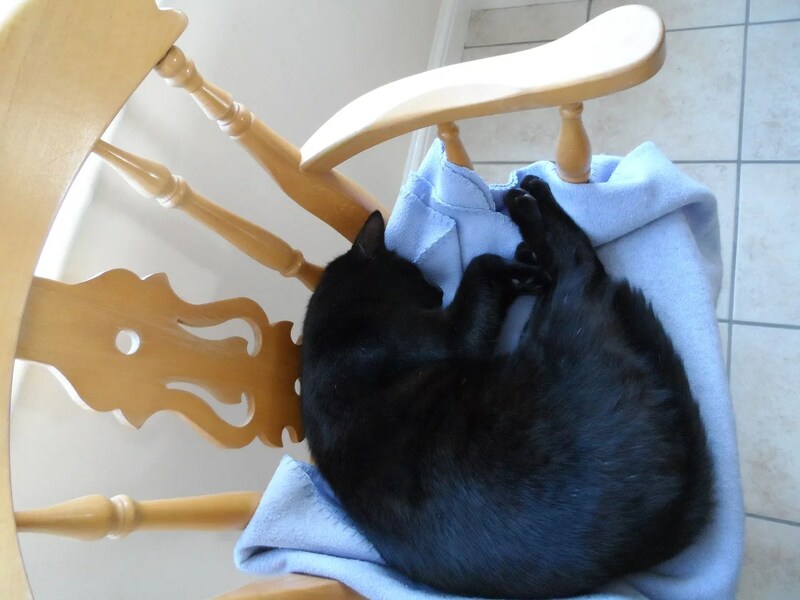 Obligatory Cat photo – yes, I must have been inspired by Black Jack’s Satanic powers. 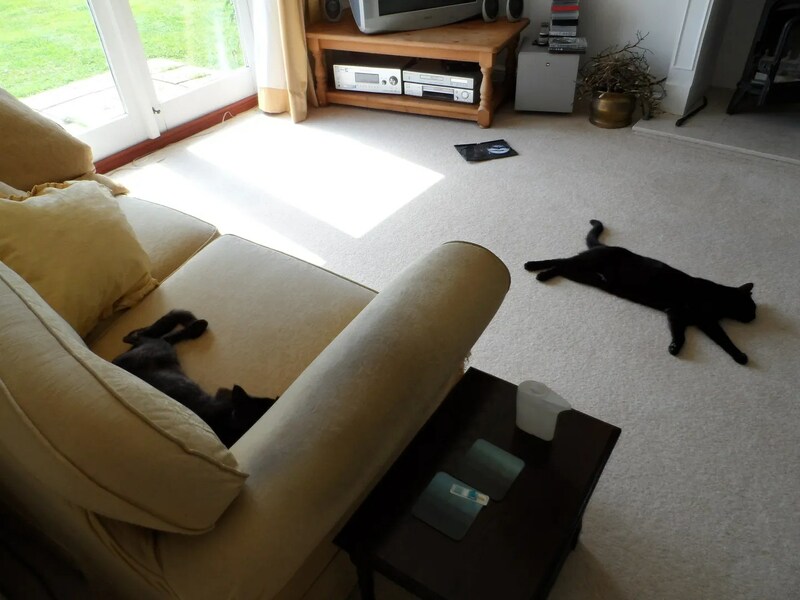 Actually, the two cats were remarkably absent from the room for the day. They gave Jim “the Evils” but eventually recognised him. 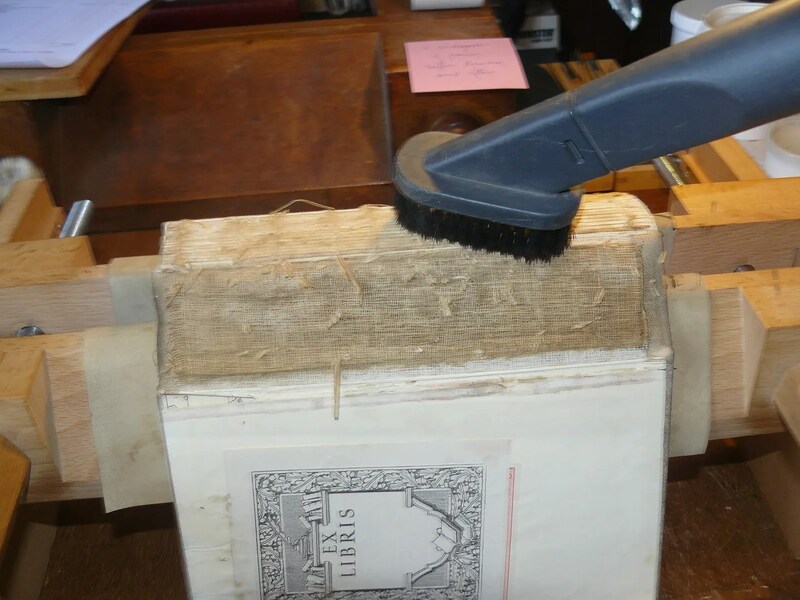 Now I’d heard of book binders and repairs to books but I’d never thought I’d ever seek their services. How wrong I was. A couple of months ago, whilst sitting in my study, I heard a crash from the lounge and found that a book shelf had fallen down catapulting many of my Back of Beyond books across the floor. 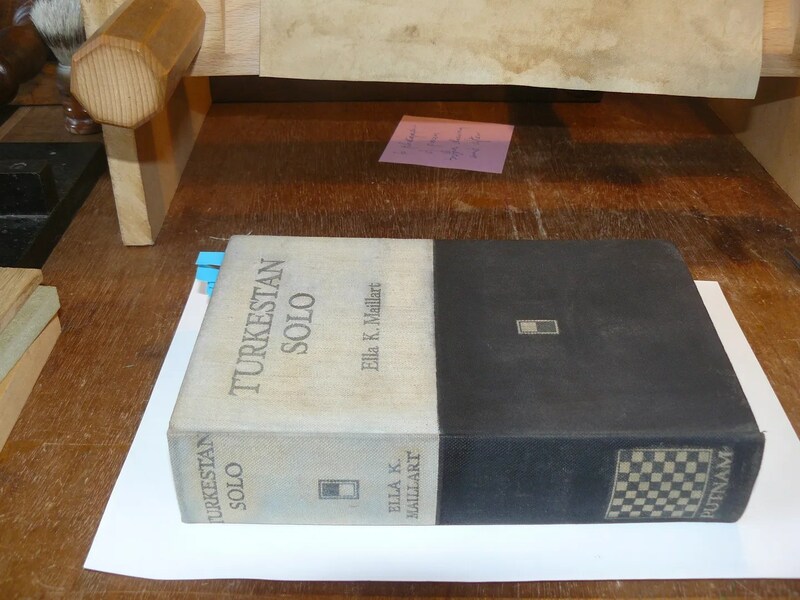 One of which was “Turkestan Solo” by Ella K Malliart. I’d picked this book up in one of my regular visits to Hay-on-Wye. 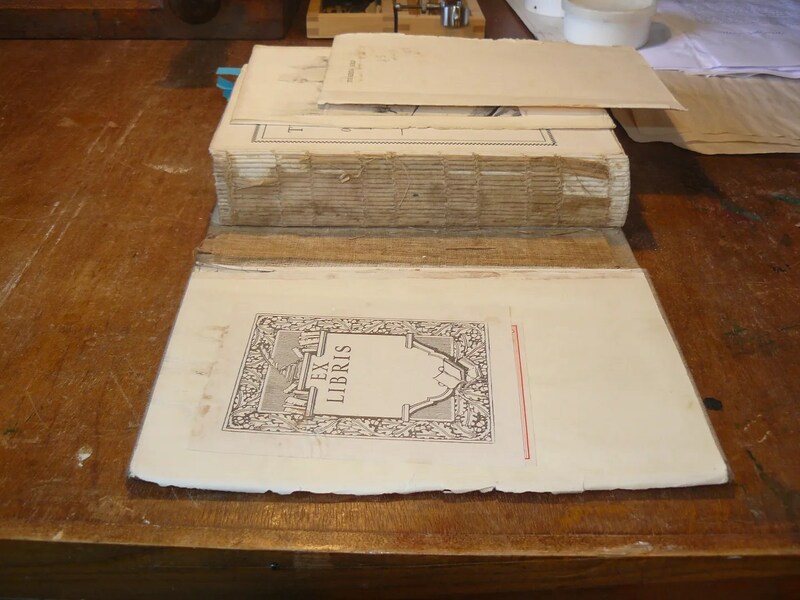 As you can see the spine was broken, and the frontispiece and a few pages were loose. 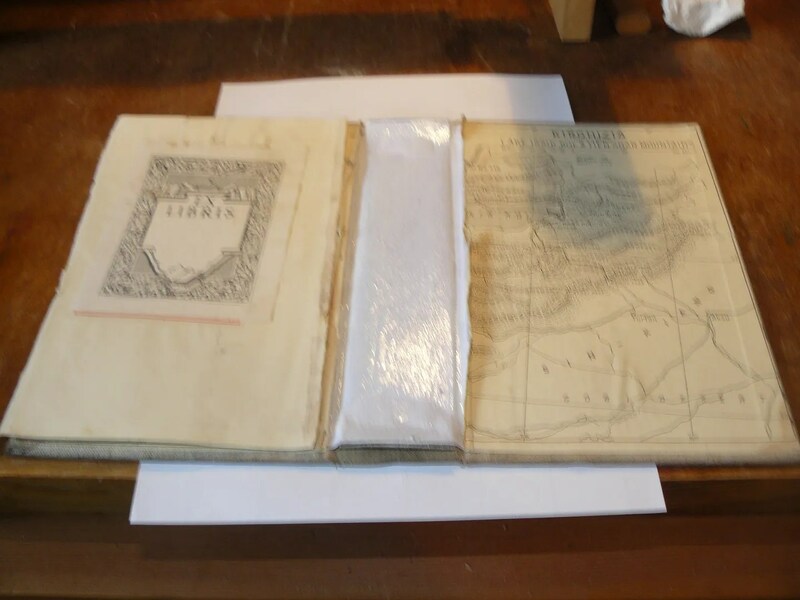 A quick check on Amazon indicated it would be an expensive book to replace, and seeing as it was otherwise in good condition, I decided to cast around and see if I could have it repaired. The images are provided by the book binder, Chris Noel. Here the spine is being cleaned. 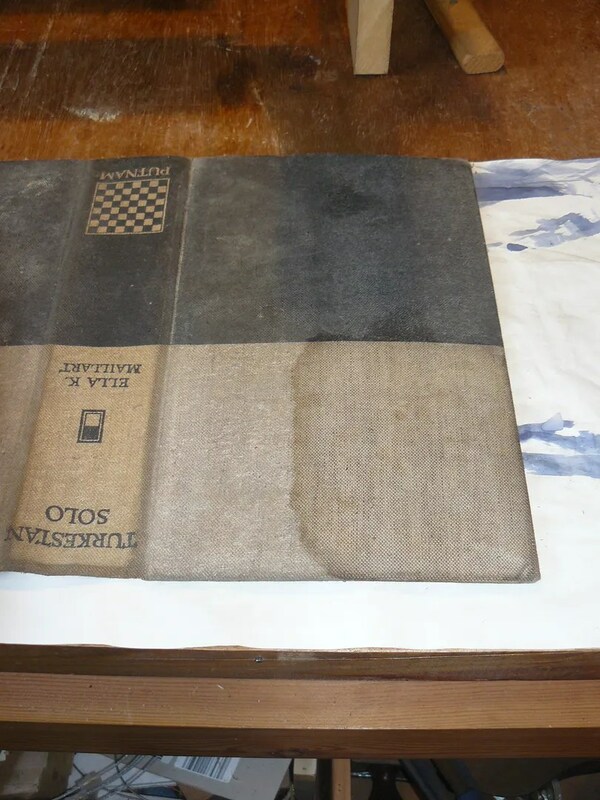 Water damage on the back cover to be repaired. 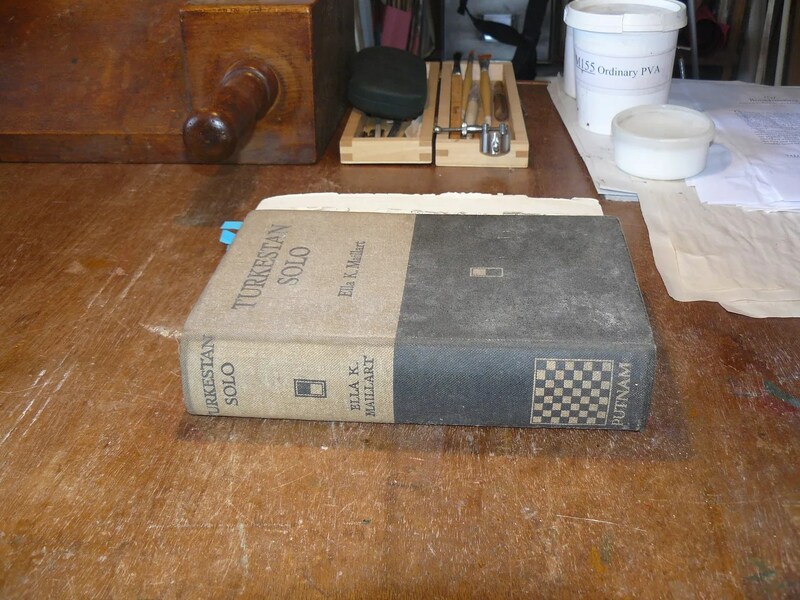 new spine lining fitted to the cover cloth before sticking back onto the text block. 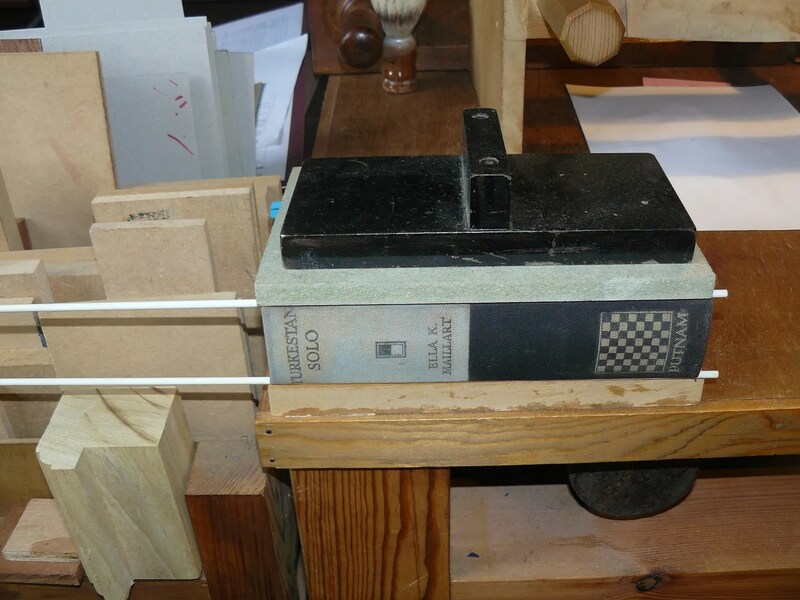 The book clamped together whilst the glue sets. So I picked up the book yesterday. Its back in one piece, and in a better shape than I ever had it in. All images taken by Chris Noel of CN Bibliographic. The price was reasonable, and I now have a book that “feels like new”, whilst retaining the patina of age. So this is how it stood at the end of the game. 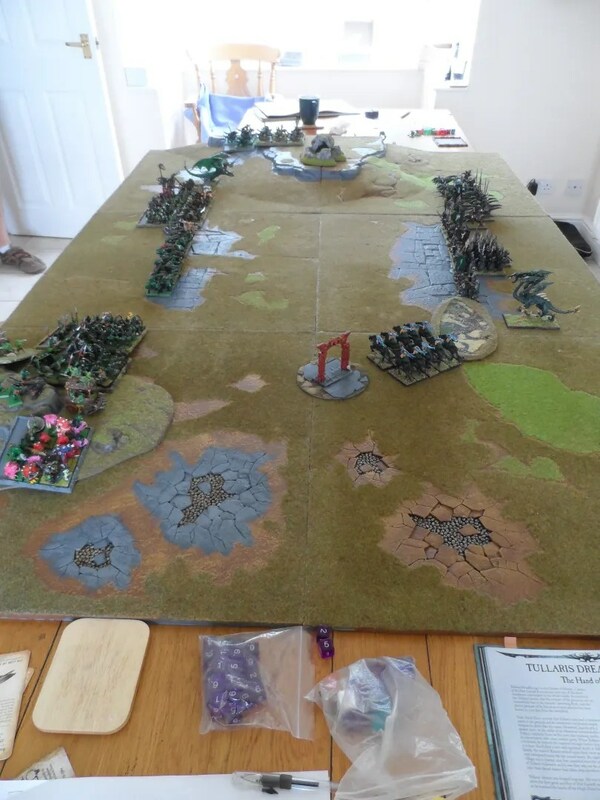 My COK were slightly harmed, my Silver Talons returned to the table, Spitty the Hydra was stil around as were a residue of RXBs. 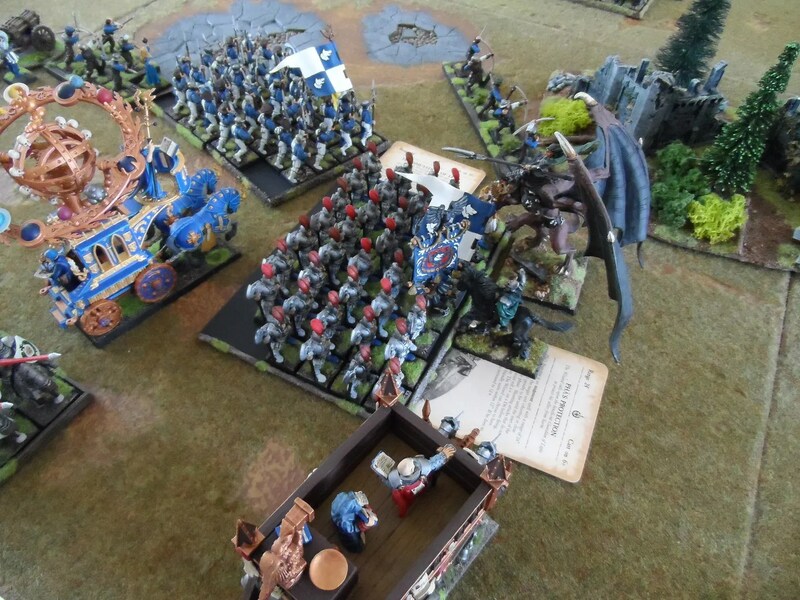 But the Empire artillery was intact as was a substantial number of Halberdiers and Hippygryphs. 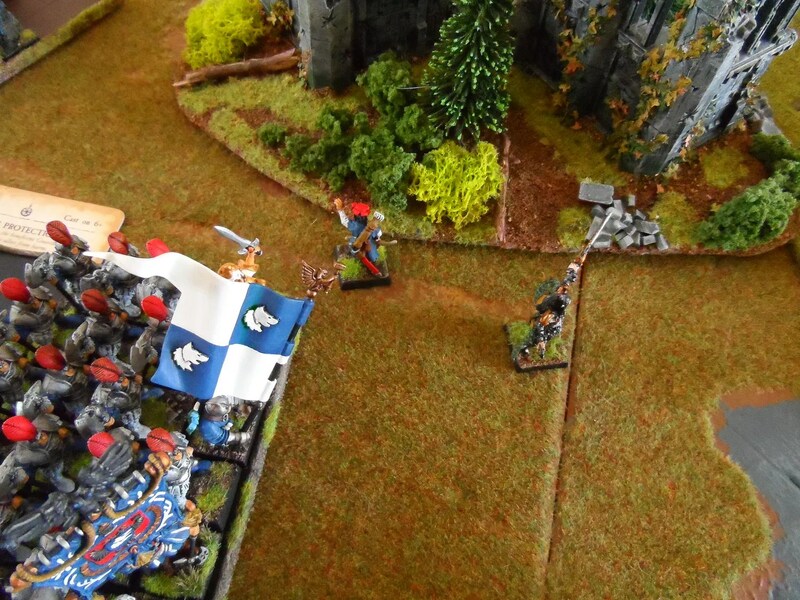 By having my COK and Eric stand still, I sucked up his PV for his knights, BUT his artillery could, and did shell me to bits. So, as usual, caution got treated with contempt. I should have gone hell for leather and stuff it all down his throat ASAP. As advocated by Black Jack. 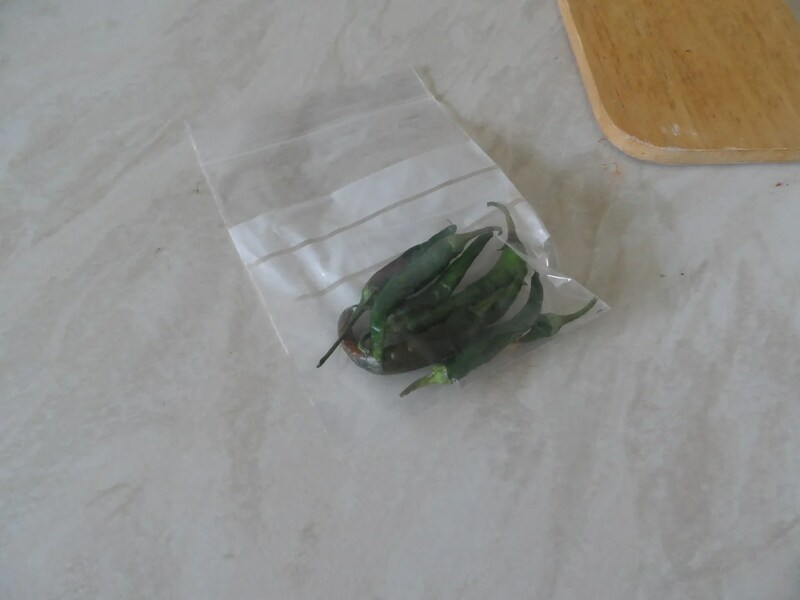 Rich brought me some of his home grown chillis, small, butI thought they might be potent. 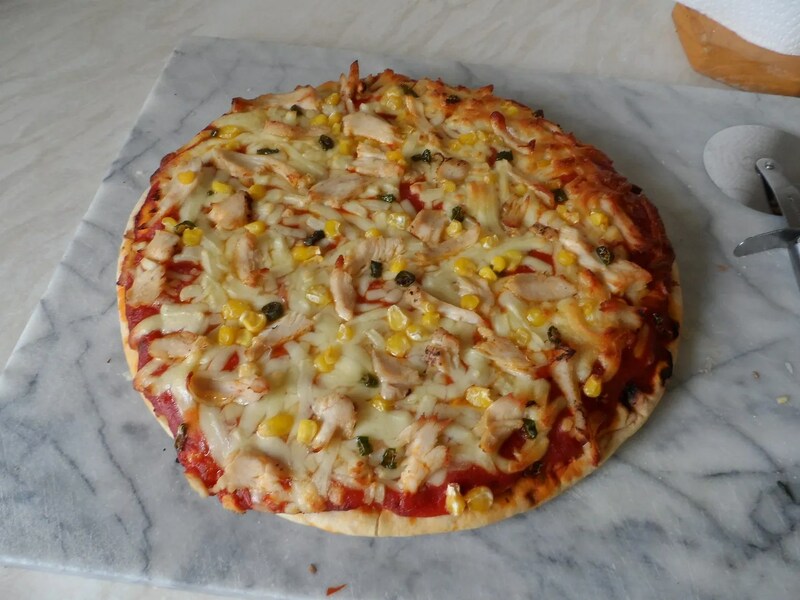 The chicken and chilli pizza. I ended up putting 4 of Rich’s chillis on it, just as well I stopped there. It made us go bright red and sweat a lot. BlackJack obviously wrote me off and simply fell asleep. 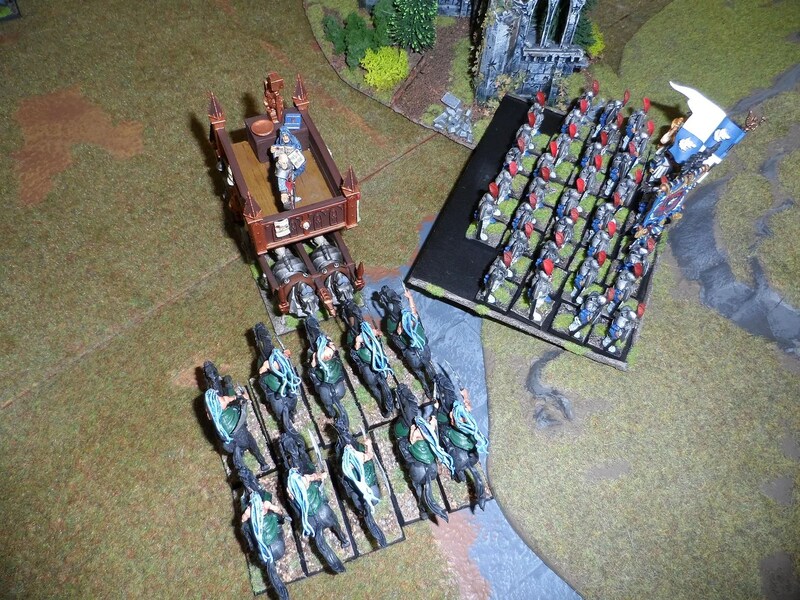 I had a strong left hand cavalry wing with the Warlocks in there, their third (?) 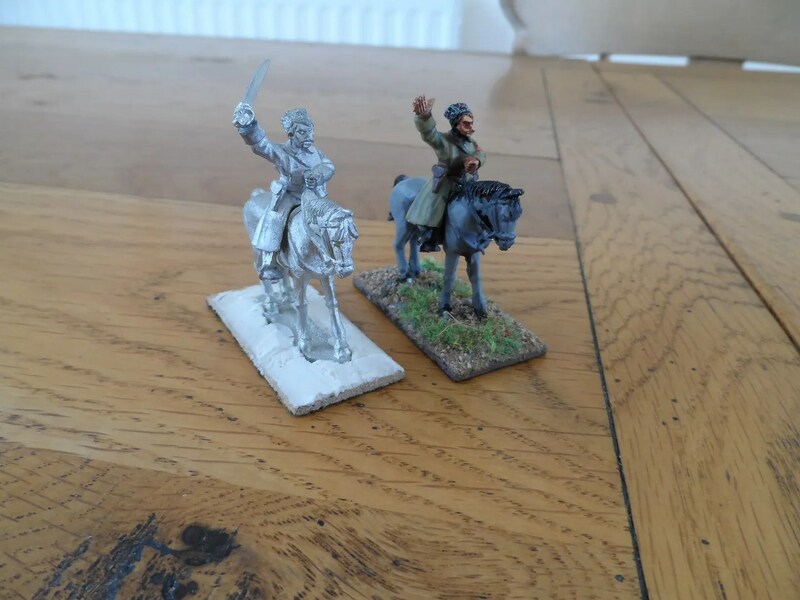 outing as I stil am assessing them as a combat/cavalry/magic unit. 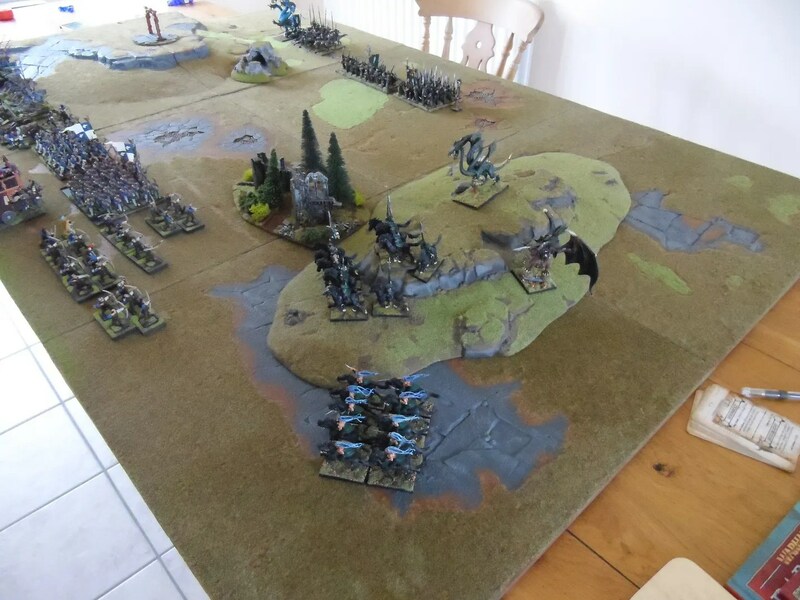 Rich confessed to mucking up his deployment, as I distracted him with Eric and the Cold One Knights, and he deplpyed his artillery and knights on his left flank against them, which caused him pain to re-roganise once he’d seen what I was up to. 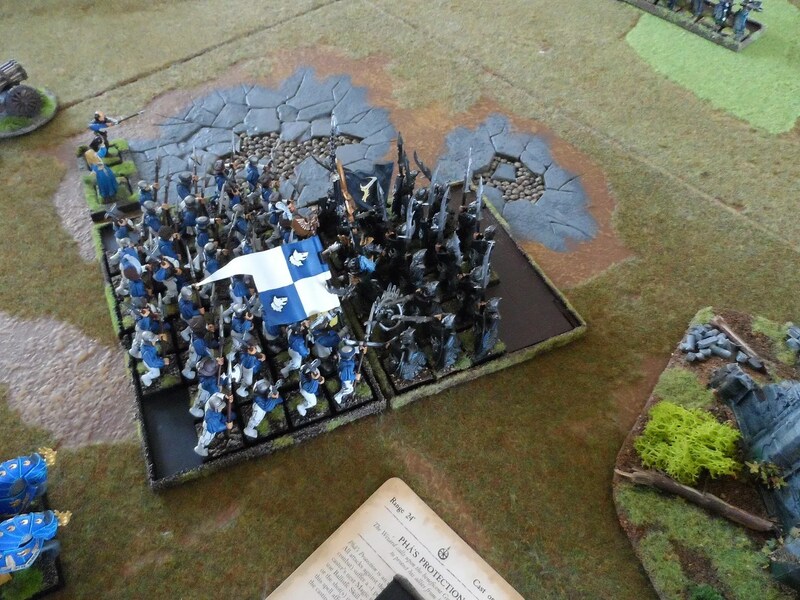 But this still left his rather impressive two infantry units facing me in the centre. 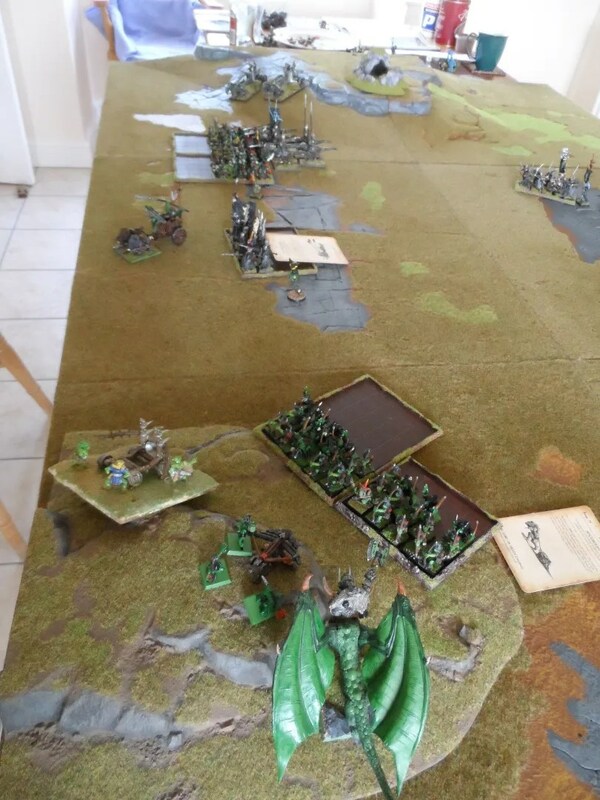 First I got the Vanguard move for the Fast Cavalry (10 Warlocks, 10 Dark Riders), then I won initiative and went first and was pouncing on his poorly defended right flank. 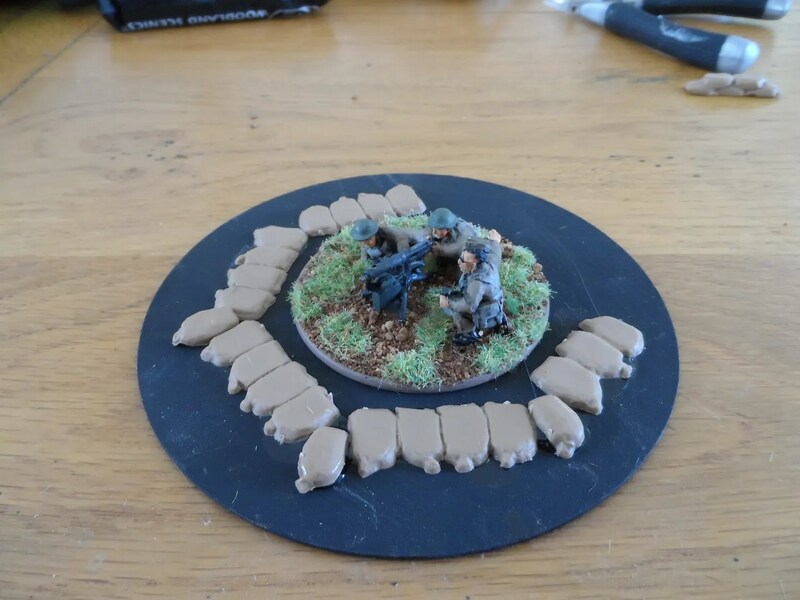 Stupidly, I did not move up the centre of my army to support them. 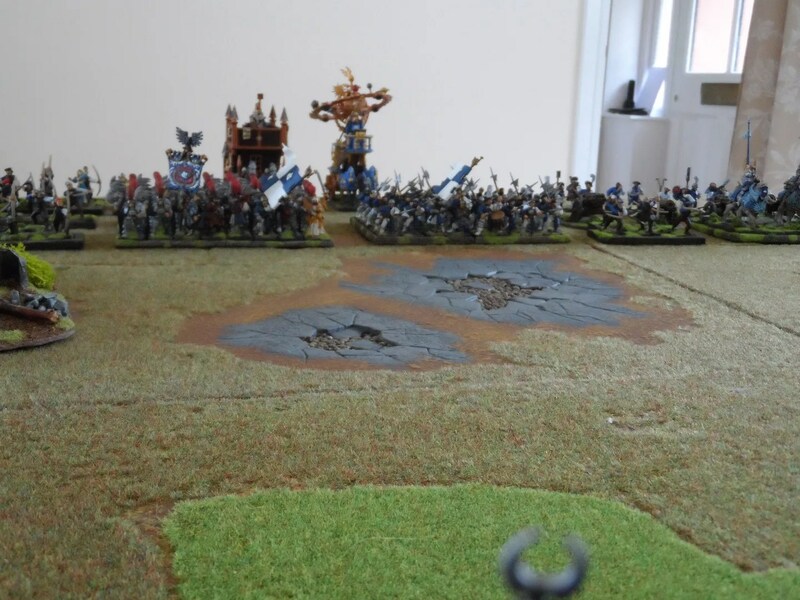 Because I thought I’d wait to see how he re-arranged his army. Pathetic, I should know better, I should have moved them up immediately. I really should learn from Belkar Bitterleaf, and know that throwing an angry housecat in the opponents face is the best way tio solve things. 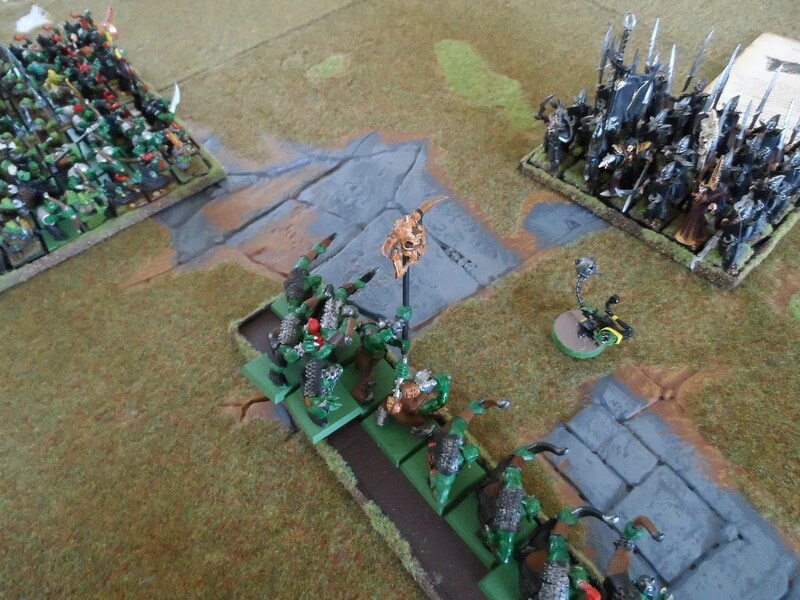 This resulted in me wiping out his skirmishers (at a price of most of my Dark Riders), and then following them up along with my army general on Manticore into one of his large units. 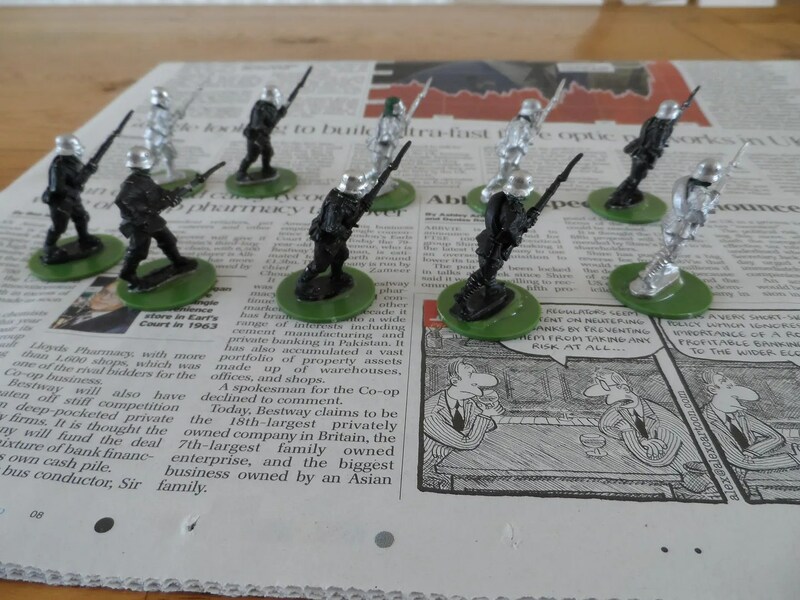 As you can see in the back ground, the Silver Talons (c30 Spearmen) are a long way away – at least two turns). 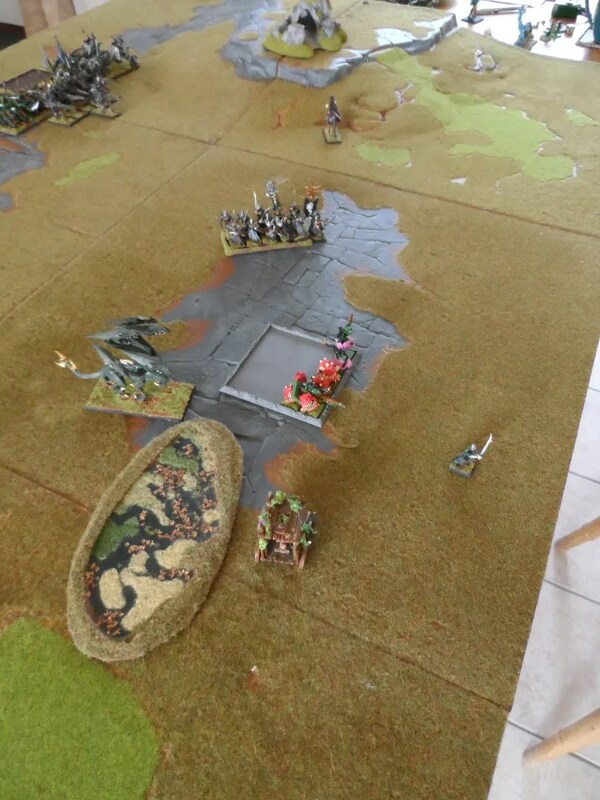 Still I hoped that the General and Manticore would cause significant casualties. Nope, the dice were as against me as they were against Rich. 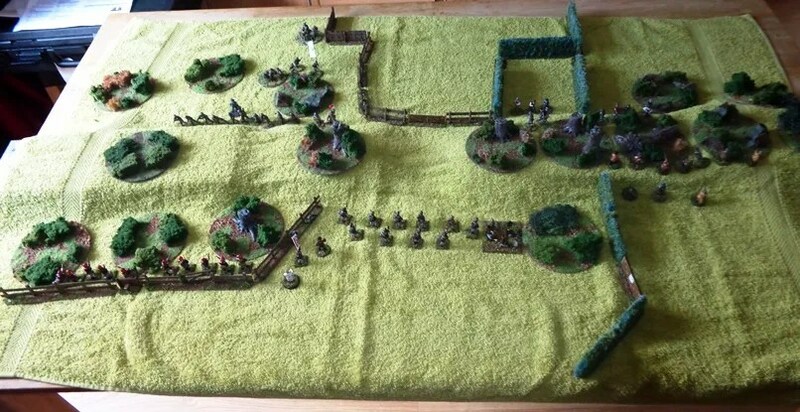 Rich starts to re-arrange his army in the meantime. Whilst both our knights faced off against each other. However, Richard managed a few shots onto Eric, so after two turns I blinked and moved Eric forward with the CoK suffering from stupidity stuck where they were. Typical. Despite not winning by a convincing margin, my general stayed in combat, and then Rich failed his LD test when I did win combat the second round. Both of us were hurling Augment and Hex spells into this fray, as you can see by the caspell cards we slipped under the models’ bases. (our one concession to on table clutter). 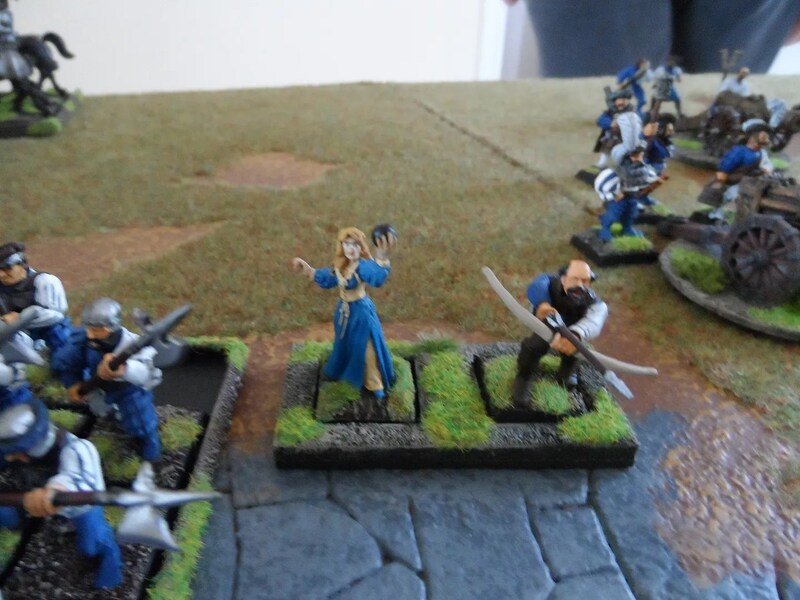 Mt RXBs whittled down an Empire detachment to one Wizardess and one archer. Much school boy humour about the wizardess holding her globes ! 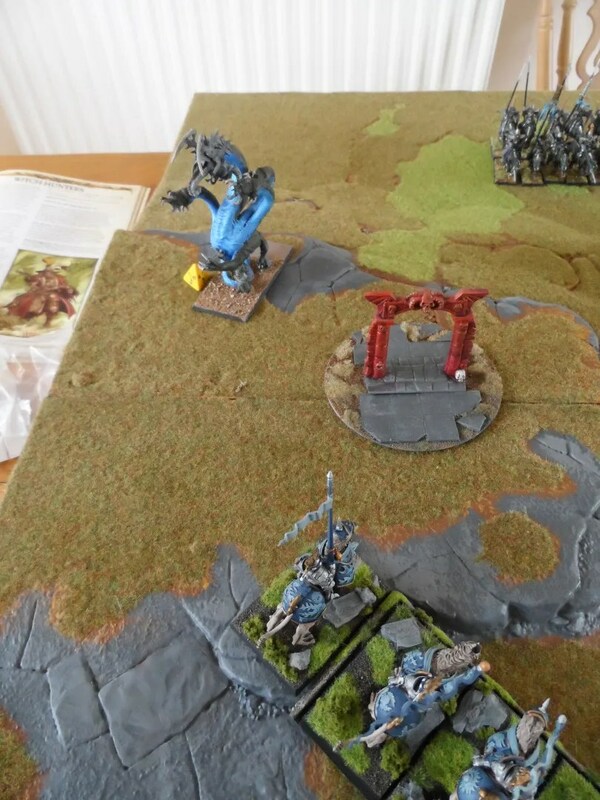 The Manticore got killed, the general was defeated. 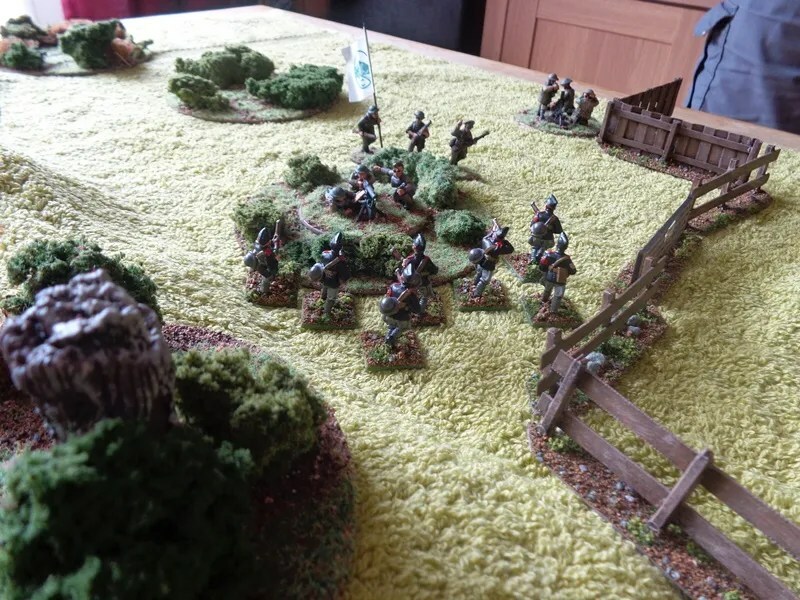 The Silver Talons after dithering and being whittled down by organ gun fire, closed in and defeated the halberdiers. But too late to rescue the general who failed his LD test, ran and was cut down by the Empire Halberdiers. Eric pranced forward, before being cut down by the Empire Cannons. 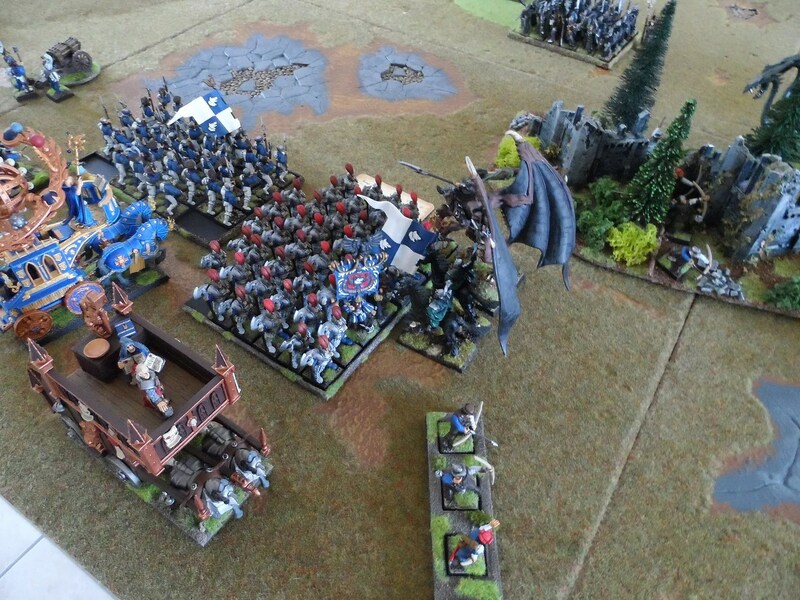 The hippygriff knights got bored and moved across the front of my army to engage the Silver Talons. The Warlocks got this Empire contraption (chariot) in the face, and whilst good were no match for it. I think they’d be good against infantry. So, because I’d idled for one round, Rich was now in a better position than me. Conclusion to follow. 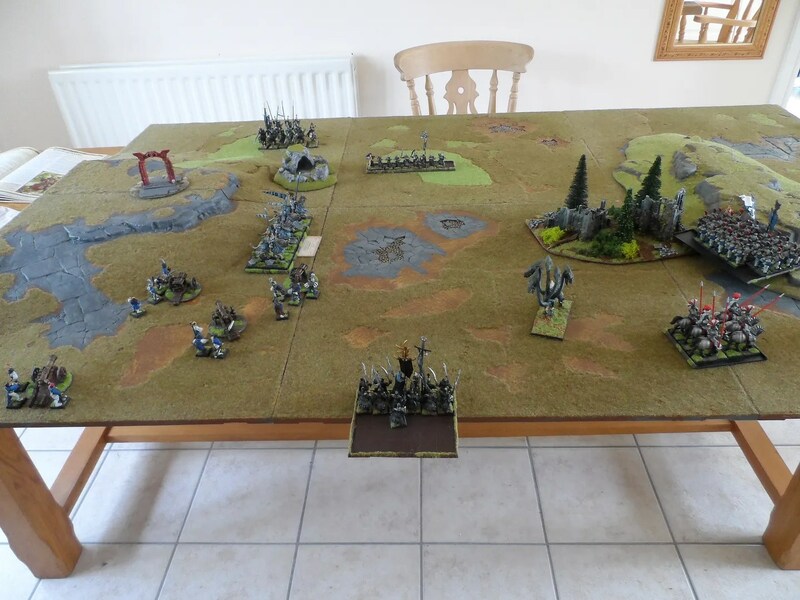 After lunch we set the table up again, using H P Lovecraft and other pulp horror books to create a ridge across the middle of the table to represent the hills above Ham Green. 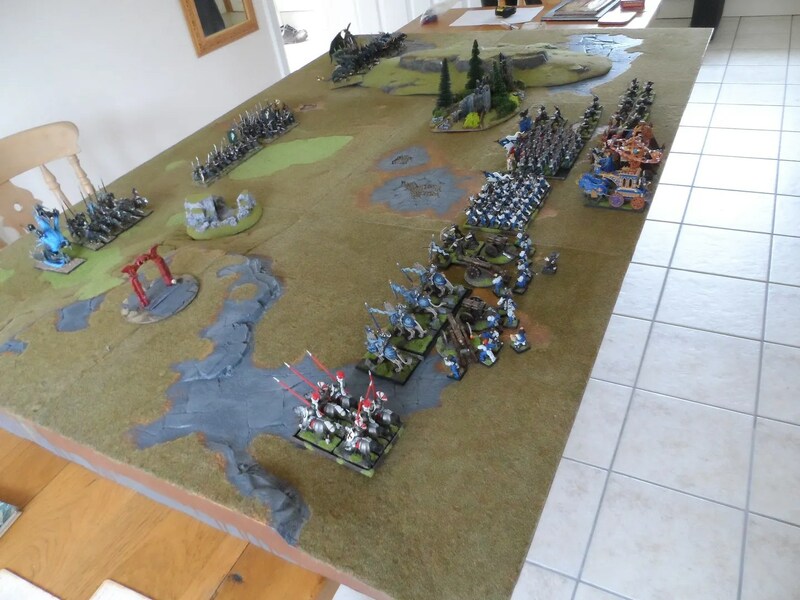 We upped the points value of the forces from 300 to 450. JP’s black shirts deployed two regular units of 10 troops, an HMG, and 10 militia along with an HQ unit. 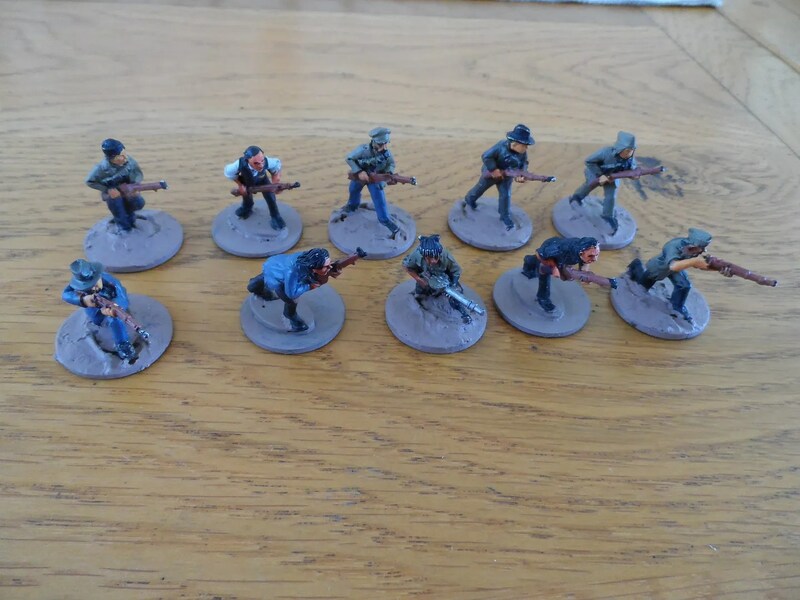 I deployed 2 x 5 shotgun armed militia, 10 Regulars, an HMG, a mortar and an HQ unit. Both of us opted to take a Medic. We were after all testing the rules out. Both sides approached the ridge on opposite sides, and it was a race to get to the crest of the ridge first. So we were expecting a shoot them up session. BUT, that suddenly changed. 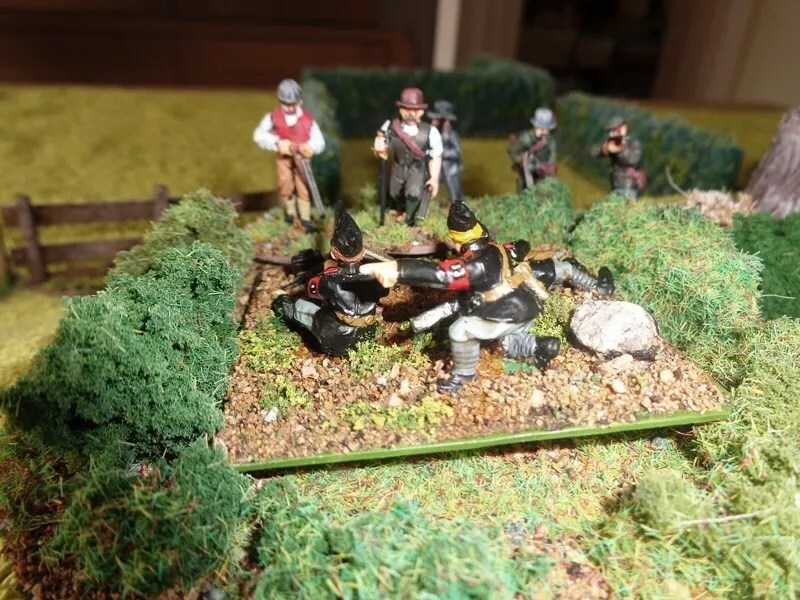 JP’s BUF moved up their HMG to some cover on the ridge, less than 6 inches from my shotgun armed militia, so in order to test the rules, I charged them in in an assault move. OUCH ! 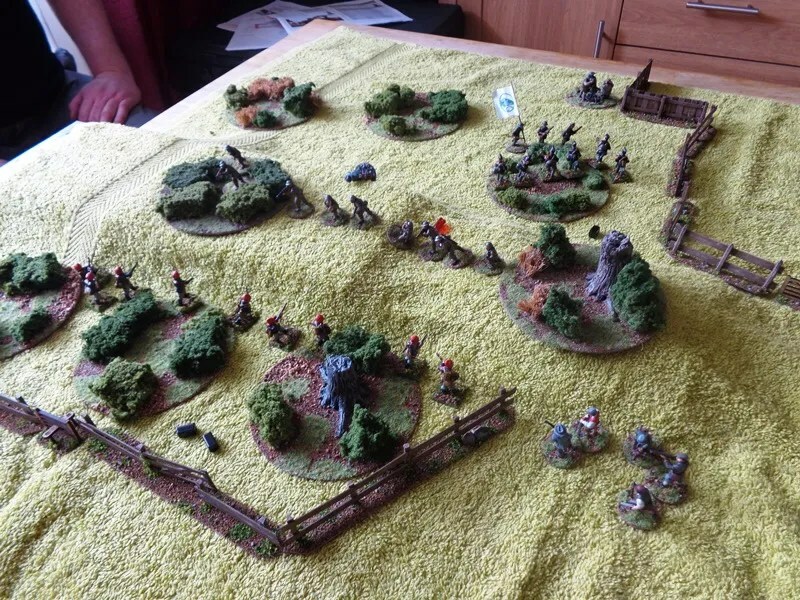 The Bolt Action rules are pretty messy in close combat – I wiped the HMG crew out entirely. Meanwhile his regulars advanced and shot my mortar spotter team. 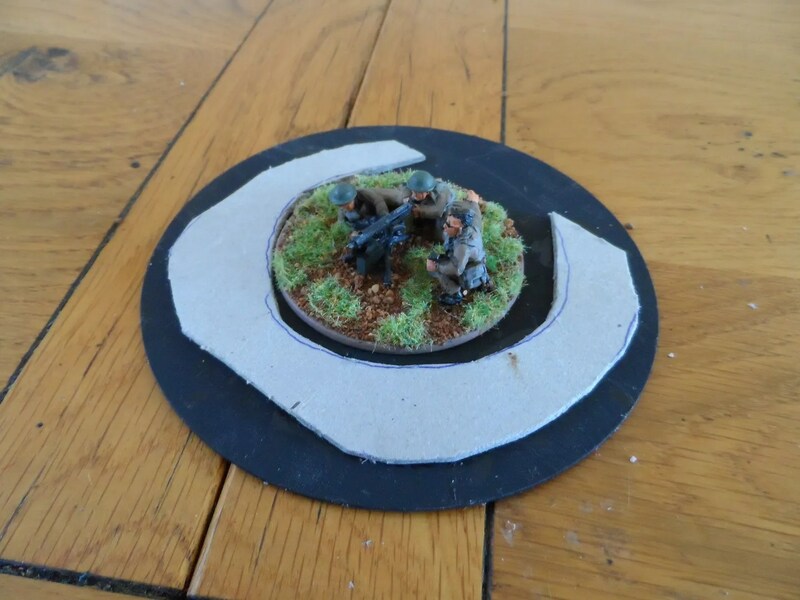 My mortar fired at them, hit and knocked off a couple of them. 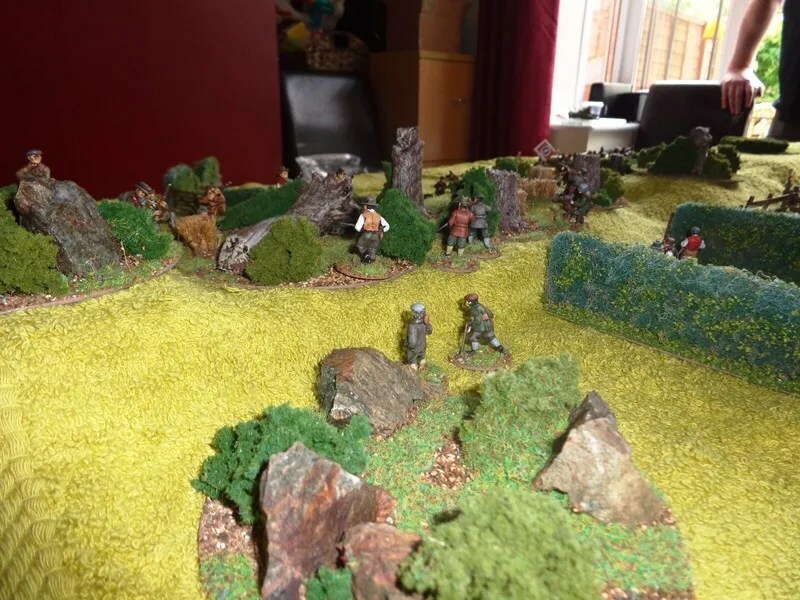 Our two regular units then did the expected stand off shooting session. 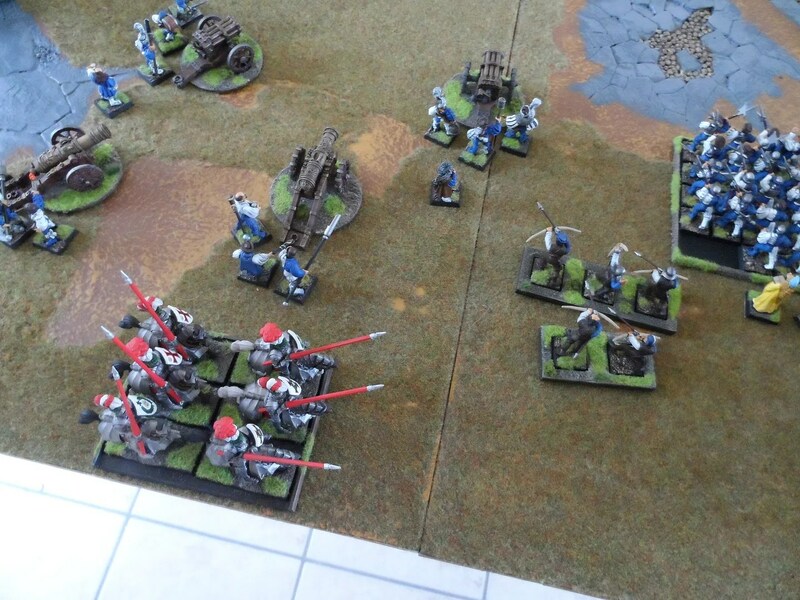 Then I got a dose of my own medicine when JP’s unit charged my HMG, with the same results. 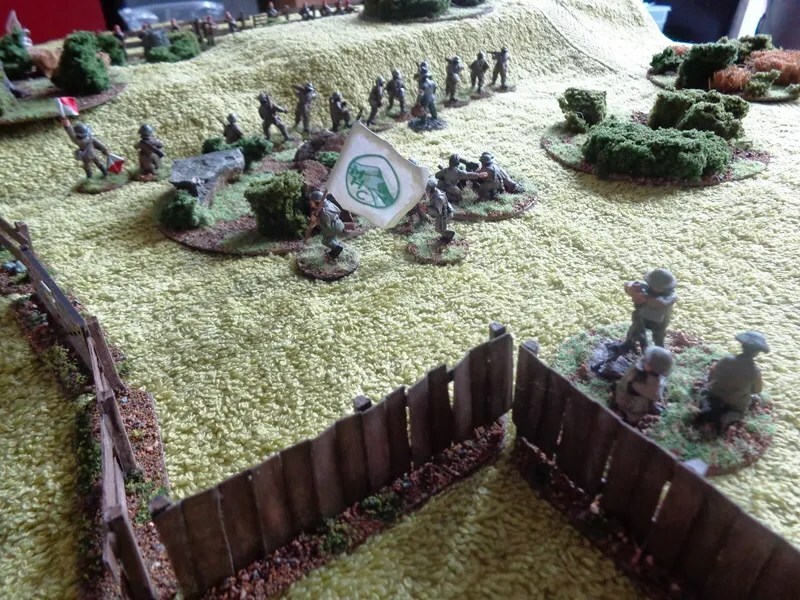 Then I charged and wiped out his HQ. 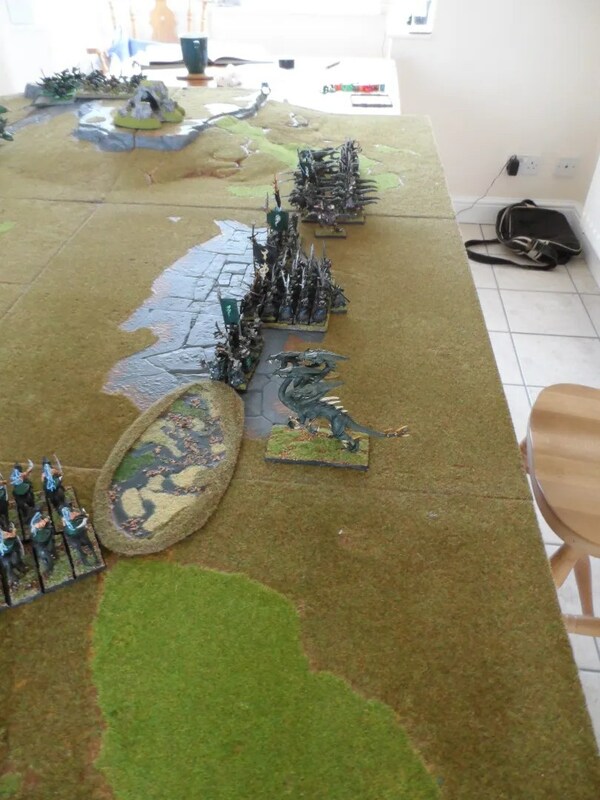 We now had units behind each others front lines. In the end the swirling melees lead us to include we had a draw.